Headmaster of any Govt. / Govt. aided / NIOS where he/she is studying. Principal, Jawahar Navodaya Vidyalaya. In case of non-availability of JNVST prescribed Application Form from the above, you may copy the format of Application Form on plain paper (preferably 21cm x 30cm) from our website at the address www.nvshq.org. JNV Selection Test for admission to Class-VI in JNVs for the academic session 2017- 18 will be held as per following schedule. The last date for submission of Application Form in BEO’s Office is 16th September 2016. On Sunday, the_8th January, 2017 at 11.30 A.M. in the State of Andhra Pradesh, Assam, Arunachal Pradesh (except Dibang Valley & Tawang Districts), Bihar, Chhattisgarh, Goa, Gujarat, Haryana, Himachal Pradesh (except Chamba, Kinnaur, Mandi, Sirmour, Kullu, Lahaul & Spiti and Shimla Districts), Jharkhand, Kerala, Karnataka, Madhya Pradesh, Maharashtra, Manipur, Orissa, Punjab, Rajasthan, Tripura, Telangana, Uttar Pradesh, & West Bengal (except Darjeeling), Union Territories of Andaman & Nicobar Islands, Chandigarh, Dadar & Nagar Haveli, Daman & Diu, Delhi, Lakshadweep and Pudducherry. On Saturday, the 8th April, 2017 at 11.30 A.M. in the States of Jammu and Kashmir (except Leh, Kargil & Doda), Meghalaya, Mizoram, Nagaland, Sikkim, Uttrakhand and in the Districts of Dibang Valley and Tawang of Arunachal Pradesh, in the Districts of Chamba, Kullu, Mandi, Sirmour of Himachal Pradesh, in the District of Darjeeling of West Bengal. On Saturday, the 10th June, 2017 at 11.30 A.M. in the Districts of Leh, Kargil & Doda of J&K State and in the District of Kinnaur, Shimla and Lahaul & Spiti of Himachal Pradesh State. Duly filled in application form must reach the Block Education Officer latest by 16th September 2016. It shall be signed by the Head of the recognized school/Special Education Scheme where the child is studying in Class-V, on or before 16th September 2016 (Candidates are advised to get the acknowledgement from the BEO at the time of submission of Application Form). Admit Cards, duly prepared by the Principal, Jawahar Navodaya Vidyalaya will be issued to the candidates through the office of the Block Education Officer. Candidates, who do not receive their Admit cards one week before the JNVST should immediately contact to Principal, JNV/BEO/DEO for the same. Selection in the test will not vest any right on the candidates to secure admission into the JNV. At the time of seeking actual admission, each selected candidate will have to produce all relevant certificates, as prescribed by the Navodaya Vidyalaya Samiti. Until admission, the selection is provisional. In case of any dispute, the decision of Navodaya Vidyalaya Samiti shall be final and binding on the candidates. Marks obtained by candidates (both selected and unselected) in the test are not communicated. There is no provision for re-evaluation of the answer scripts. Since the result is processed through computer and sufficient care is taken to ensure accuracy through various checks in processing the result, no request for re-totaling of marks will be entertained. It may also be noted by the candidates and their parents/guardians that under the scheme of JNVs, students of a JNV located in Hindi speaking State may have to be migrated to another JNV in Non-Hindi Speaking State and vice-versa for one academic year when the students are promoted to Class IX. In case of refusal from the students selected for migration, continuation of such students in JNV will not be allowed. The candidates and their parents/guardians may note that the children selected on the basis of the Test will be admitted only in the JNV located in the district from where they are appearing at the JNVST. Under no circumstances, the selected candidate will be given admission to any other JNV. No request for shifting of students on account of medium of instruction in the JNV concerned, shifting of parents/guardians to other district(s) State(s) etc. will be entertained. Candidates belonging to the Scheduled Castes (SCs) and Scheduled Tribes (STs) will have to produce a certificate of the Caste/Tribe at the time of seeking admission, if selected. Such certificate should be procured from the competent authority before 15th May, of the year of seeking admission so that it may be submitted to the Principal of concerned JNV at the time of admission. Candidates belonging to the disabled category (Orthopedically Handicapped, Hearing Impaired and Visually Handicapped) if selected will have to produce a medical certificate signed by Chief Medical Officer of the District concerned at the time of admission. Candidates belonging to the disabled category (Orthopedically Handicapped, Hearing Impaired and Visually Handicapped) can seek admission in the district in which they are studying in Class V on regular basis at the time of applying for JNVST or their native district where his/her parents are residing. 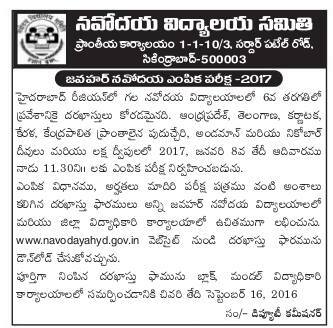 No Comment to " Navodaya Entrance Test Notification 2016 "